Like most photographers, I’m drawn to the beautiful and scenic places when traveling. I love capturing a city’s landmarks, the places for which it is known and which shape its character. You can learn a lot about a place by the sites its people choose to celebrate and memorialize. June 2016, panorama from 8 vertical images in 2 rows, additional exposures for highlights, focal length 16mm, aperture f/8, shutter speed 13 seconds, ISO 64, tripod. During my time in Lloret de Mar, I photographed its iconic seafront and the beautiful — if often misidentified — castle at the eastern end of its promenade. 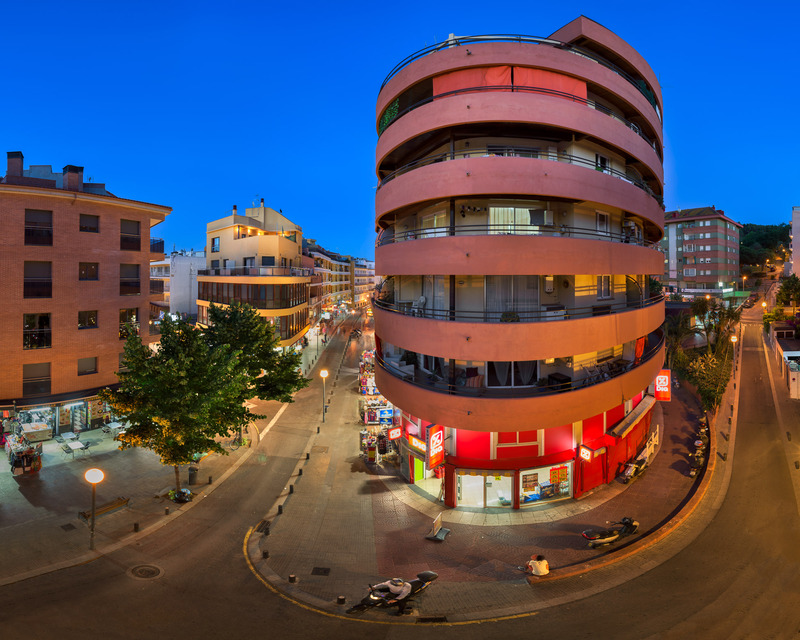 But one of my favorite views of Lloret de Mar was the simple, unadorned view from my hotel balcony, which I found particularly charming by night. It’s not a famous or especially picturesque view, but I love it — it captures a lazy evening in a resort town on the coast, a lovely blue twilight by the sea. On this particular night, the linden trees were in full bloom and the air was fragrant with their scent. On a still night by the sea, the faint light of early evening and the heady scent of linden made for a lovely end to my trip. I set up my tripod on the balcony and focused the shot on the curvature of the street below. I only wish that I could capture the scent of the trees in the photograph.